The Portable Countermeasures CounterTeK kit saves you money and gives you three pieces of countermeasures sweep gear to conduct countermeasures sweeps. You save $340.00 over individual pricing! 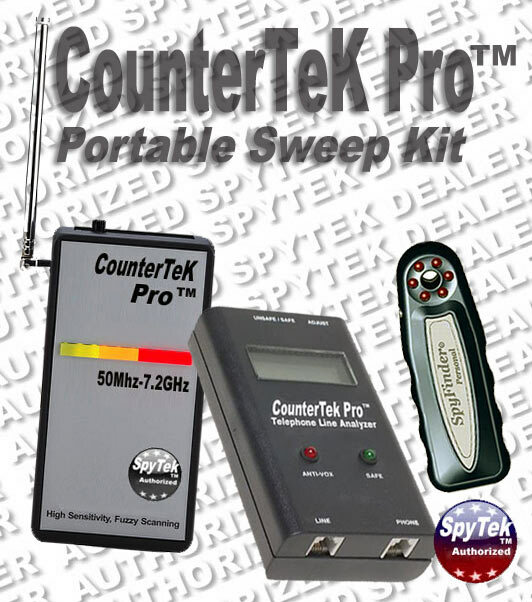 You obtain the new generation high sweeping range CounterTek Pro bug detector, the new generation CounterTek Pro telephone line analyzer to sweep phones and phone lines and the new generation video camera detector that will find any video camera dead or alive quickly and easily. To review each product, just click on the link below!